Sanlorenzo presented its new SL94 series at the Yacht Club de Monaco on the penultimate evening of the Monaco Yacht Show. The yacht arrived just in time to be the star of the show put on by the Italian yard, and guests were treated to a first viewing. The SL94 is inspired by the successful SL104 series, which marked an evolution in the Sanlorenzo style. Like her bigger sister, the SL94 has large windows and portholes bringing in a lot of natural light, and a contemporary profile. Designed by Francesco Paszkowski and the in-house team, the 28.6m motor yacht was built in composite at the group's Ameglia shipyard. Special features include a flybridge (with an optional hardtop), which is free of a tender thanks to the large stern garage. This first yacht has a modern interior designed by Francesco Paszkowski. 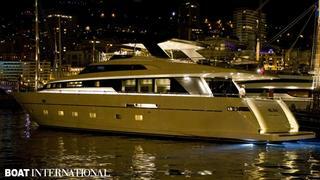 Her layout accommodates eight guests on the lower deck in a master suite, VIP and two twin cabins. The full-beam master is open plan, giving a very roomy feeling for a yacht of this size. Crew quarters for four are large, and together with the galley and mess are located on the main deck with direct access outside. In the engine room, two options are possible: two 1,415kW Caterpillar C-32 Acerts giving a top speed of 27 knots and cruising speed of 25 knots, or twin 1,630kW MTU 16V 2000M92s with performances between 26 and 29 knots. The next opportunity to view this yacht will be at the Genoa Boat Show from 1 to 9 October.